A JFET is a three terminal semiconductor device in which current conduction is by one type of carrier i.e. electrons or holes. 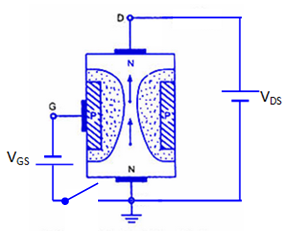 The current conduction is controlled by means of an electric field between the gate and the conducting channel of the device. The JFET has high input impedance and low noise level. A JFET consists of a p-type or n-type silicon bar containing two pn junctions at the sides as shown in fig.1. The bar forms the conducting channel for the charge carriers. If the bar is of p-type, it is called p-channel JFET as shown in fig.1(i) and if the bar is of n-type, it is called n-channel JFET as shown in fig.1(ii). The two pn junctions forming diodes are connected internally and a common terminal called gate is taken out. Other terminals are source and drain taken out from the bar as shown in fig.1. Thus a JFET has three terminals such as , gate (G), source (S) and drain (D). Fig.2 (i) shows the n-channel JFET polarities and fig.2 (ii) shows the p-channel JFET polarities. In each case, the voltage between the gate and source is such that the gate is reverse biased. The source and the drain terminals are interchangeable. The input circuit ( i.e. gate to source) of a JFET is reverse biased. This means that the device has high input impedance. The drain is so biased w.r.t. source that drain current ID flows from the source to drain. In all JFETs, source current IS is equal to the drain current i.e IS = ID. Fig.3 shows the circuit of n-channel JFET with normal polarities. The two pn junctions at the sides form two depletion layers. The current conduction by charge carriers (i.e. electrons) is through the channel between the two depletion layers and out of the drain. The width and hence resistance of this channel can be controlled by changing the input voltage VGS. The greater the reverse voltage VGS, the wider will be the depletion layer and narrower will be the conducting channel. The narrower channel means greater resistance and hence source to drain current decreases. Reverse will happen when VGS decreases. Thus JFET operates on the principle that width and hence resistance of the conducting channel can be varied by changing the reverse voltage VGS. In other word, the magnitude of drain current ID can be changed by altering VGS. 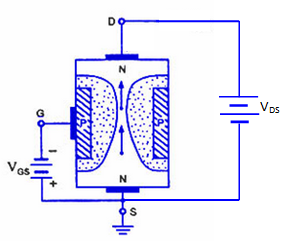 When a voltage VDS is applied between drain and source terminals and voltage on the gate is zero as shown in fig.3(i), the two pn junctions at the sides of the bar establish depletion layers. The electrons will flow from source to drain through a channel between the depletion layers. The size of the depletion layers determines the width of the channel and hence current conduction through the bar. When a reverse voltage VGS is applied between gate and source terminals, as shown in fig.3(ii), the width of depletion layer is increased. This reduces the width of conducting channel, thereby increasing the resistance of n-type bar. Consequently, the current from source to drain is decreased. On the other hand, when the reverse bias on the gate is decreased, the width of the depletion layer also decreases. This increases the width of the conducting channel and hence source to drain current. A p-channel JFET operates in the same manner as an n-channel JFET except that channel current carriers will be the holes instead of electrons and polarities of VGS and VDS are reversed. Fig.4 shows the schematic symbol of JFET. In a JFET, there is only one type of carrier,i.e. holes in p-type channel and electrons in n-type channel. For this reason it is also called unipolar transistor.However, in an ordinary BJT, both electrons and holes play role in conduction. Therefore, it is called as bipolar transistor. As the input circuit of a JFET is reverse biased, therefore, it has a high input impedance. However, the input circuit of a BJT is forward biased and hence has low input impedance. The primary functional difference between the JFET and BJT is that no current enters the gate of JFET. However, in typical BJT base current might be a few µA. A BJT uses the current into its base to control a large current between collector and emitter. Whereas a JFET uses voltage on the gate terminal to control the current between drain and source. In JFET, there is no junction. Therefore, noise level in JFET is very small. It has a very high input impedance. This permits high degree of isolation between the input and output circuits. The operation of a JFET depends upon the bulk material current carriers that do not cross junctions. Therefore, the inherent noise of tubes and those of transistors are not present in a JFET. A JFET has a negative temperature co-efficient of resistance. This avoids the risk of thermal runaway. A JFET has a very high power gain. This eliminates the necessity of using driver stages.